The best ever greek chicken recipe using bone in chicken breasts served with baked spaghetti squash tossed with lots of veggies. 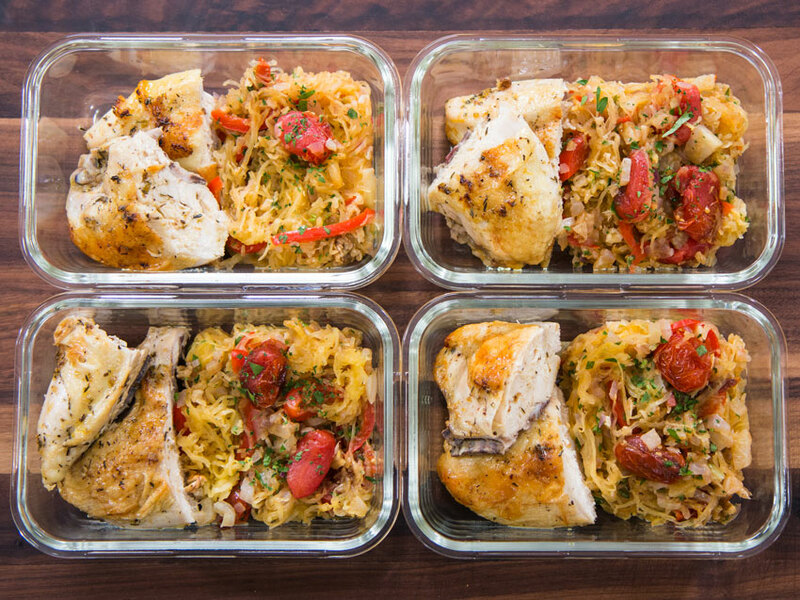 This chicken meal prep recipe makes 5 servings for the week. If you tend to make dry and overcooked chicken breasts, it’s because you are using boneless breasts. This chicken meal prep recipe has juicy bone-in chicken breasts tossed in the best Greek marinade. Baking the chicken on the bone adds more moisture, flavor, and prevents it from overcooking. For this meal prep recipe you will need 5 bone in chicken breasts, and make sure to roast them in a 400 degree F oven for only 45-55 minutes or until the internal temperature is 155 degrees F. Once you take the chicken out of the oven, it will continue cooking (also known as carry over heat) another 5 degrees to 160. That is true for all protein except seafood. 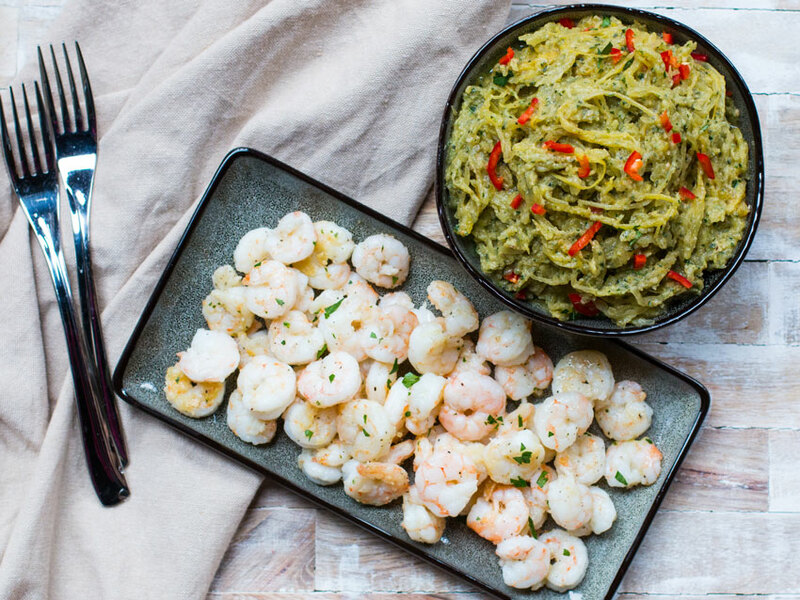 Make sure to check out my other meal prep recipes that feature spaghetti squash like this creamy pesto and shrimp meal prep and this this yogurt marinated chicken thighs and spaghetti squash recipe. For the Greek style marinade you will need olive oil, dried oregano, lots of lemon juice, and grated garlic. This Greek marinade will add lots of moisture to the bone-in chicken breasts, which tend to need a lot of love in the flavor department. 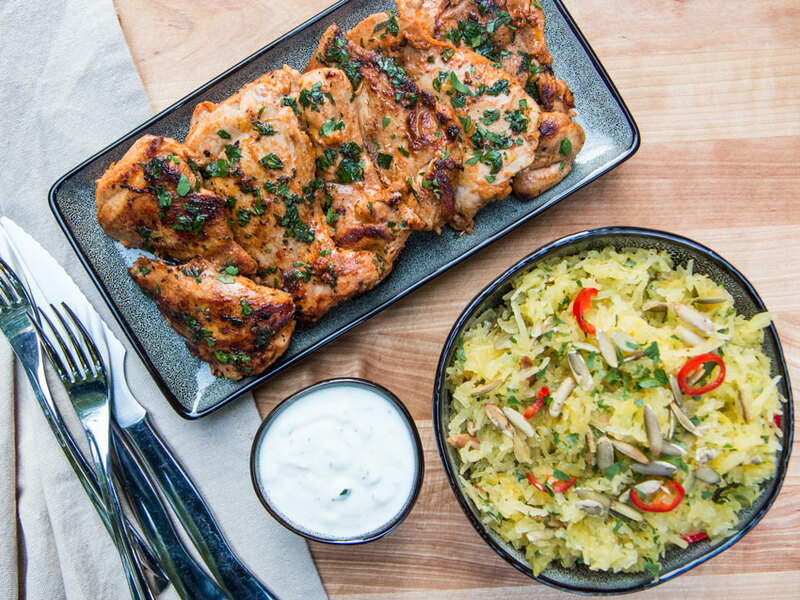 You can allow the Greek marinade to sit on the chicken for up to 2 hours, but any longer and the lemon juice will start to make the chicken meat mushy. Make sure the chicken breasts are at room temperature before baking in the oven. Cold chicken in a hot oven can make it cook unevenly and make the texture tough. Once you cook the bone-in chicken breasts, they will keep for 5 days in the fridge or can be frozen for 2-3 months. 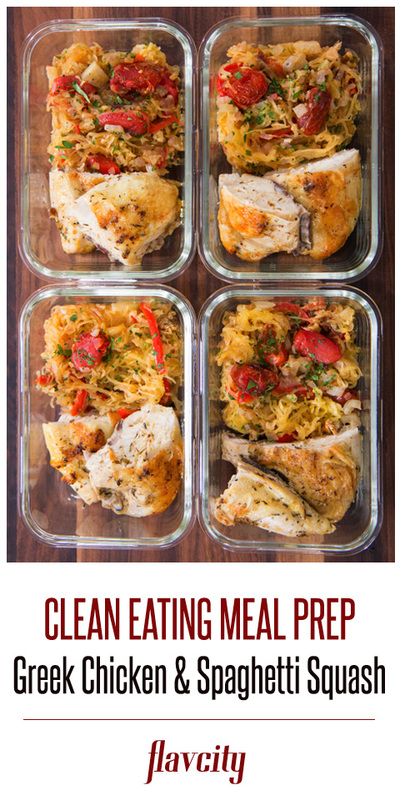 The most important thing is how you reheat the meal prep since chicken breasts can easily get dry. The preferred method is to reheat in a 350 degree F degree oven for 8-10 minutes. 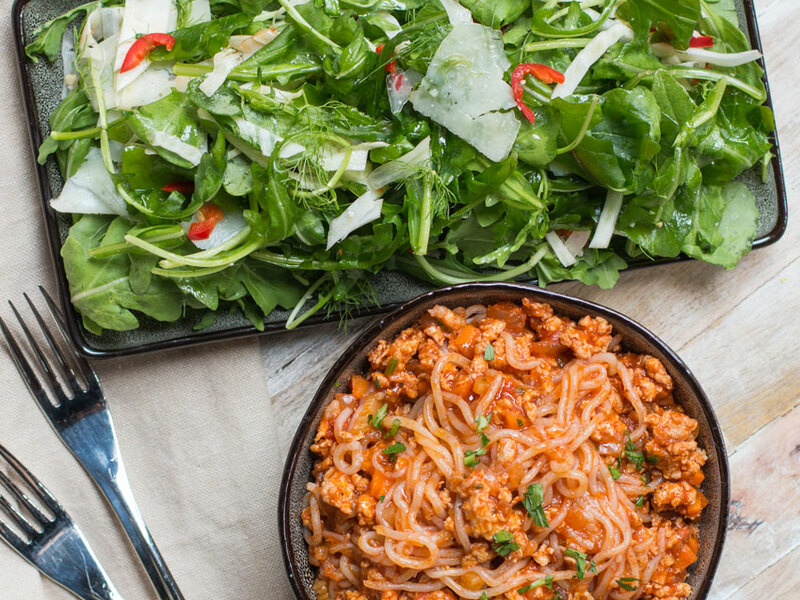 It helps if you drizzle some olive oil over to keep it moist. Yes, you can reheat meal prep in the microwave, but you need to cover the container with a wet paper towel and make sure not to overheat. Otherwise the chicken will get dry. Try to reheat on the medium setting in intervals of 30 seconds. Chicken breast will dry out very easily in the microwave. Oven roasted bone on chicken breasts covered in a tangy Greek marinade and served wit baked spaghetti squash tossed with lots of veggie. Roast chicken as soon as the squash comes out of the oven or roast at the same time but lower the oven temperature to 375 degrees F. This will increase the squash cooking time by 20 minutes. For the squash, pre-heat the oven to 400 degrees F. Carefully cut the squash in half from top to bottom and scoop out the seeds. Place squash on a tin foil lined sheet tray and season the inside of the squash with a drizzle of olive oil, a generous pinch of salt, and a couple cracks of pepper. Roast in the oven for 65-75 minutes until the nice and golden on top. You will know the squash is ready when a knife pierces deep in the flesh with ease, if it still feels hard, roast for another 15 minutes. While the squash is roasting, toss the cherry tomatoes with 1 tablespoon each of olive oil and balsamic vinegar, along with ½ teaspoon salt, and a couple cracks of pepper. Mix well and place on a tin foil lined sheet tray and roast in the oven with the squash for 20 minutes, or until the tomatoes burst and look slightly wilted. Set aside. Pre-heat a large pan over medium heat with 1.5 tablespoons of olive oil. Add the chopped onions and next 2 ingredients along with ½ teaspoon of salt and a couple cracks of pepper. Cook for 7 minutes, stirring occasionally. Add the garlic and sliced chile peppers and cook for another 4 minutes or until all the veggies have softened. Check for seasoning, you may need a small pinch of salt. Turn off the heat and set aside. Once the squash has cooled down, use a large fork and rake the squash from top to bottom. Scrape out all of the strands of squash and add them to the pan with the cooked veggies. Turn the heat on medium and cook everything together for 3 minutes, stirring well. Turn off the heat and add the lemon zest, lemon juice, walnuts, and parsley. Mix well and check for seasoning, you will most likely need a pinch of salt and maybe a little more lemon juice. Set aside. Let the chicken breasts sit at room temperature for 20 minutes before cooking and raise the oven temperature to 400 degrees F. Make the marinade by combining the garlic and next 4 ingredients in a small bowl, whisk well to combine. Place the chicken breasts on a tin foil lined sheet tray and season both sides with a generous pinch of salt and a few grind of pepper. Pour the marinade all over the chicken and roast in the oven for 45 minutes, skin side up. Remove from oven and set aside. For the tea, bring the water and next 4 ingredients to a low simmer for 7 minutes. Take off heat and add the lemon juice. Strain the tea into serving cups and add 1-2 teaspoons of honey in each cup. If using raw honey, wait for the tea to cool down a little so the heat doesn't destroy some of the nutrients. You can make a double batch and leave the leftover tea in the pot at room temperature overnight. 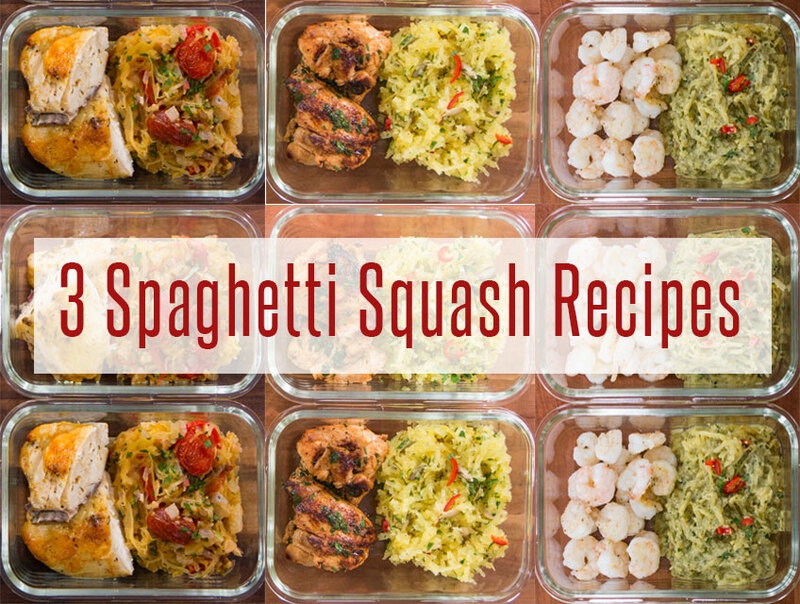 Prepare you meal prep containers for the week and enjoy! Is there a substitute for Fennel? I can’t find it . You mentioned Celery, would that suffice? Thank you! My sister and I made this dish this afternoon and it was a big hit. It had a delicious flavor, but we found the directions confusing. Sometimes I couldn’t tell if you were talking about the chicken portion or the veggie portion. However, we liked it enough to revise and simplify the directions for future use. I am not fond of fennel and left it out. I will substitute celery next time. Thank you. This was a healthy, flavorful recipe. Sorry that portions of it were confusing. I am happy you were able to tweak the recipe to your tastes and that you enjoyed. I just made this for the week and of course I had to try for seasoning and its SOOO good! I didnt add the fennel because I’ve never had it so I had no clue how to chop it up or what to do with it but I dont think I needed it because it was really delicious. Thanks so much Bobby and Dessi you guys are great! SOOO happy you enjoyed the recipe! The fennel is rather easy to work with: just cut off the stalks/fronds so that you’re left with just the bulb. Cut the bulb in half vertically so that you’re left with two symmetrical halves (ie…cut the root end in half). Cut out the core of it as a wedge….it makes a line where it meets the rest of the bulb (do this for both halves of the fennel bulb). You can then make planks and chop into a dice.